This is a stupid joke. A silly one. And in some way, part of it shows the cynical nature of Israelis. It is not meant to insult anyone but rather to amuse. It feeds the stereotype; pokes fun at everyone. Only in some way, as it is told in Israel, the joke becomes a reflection of what we see in our region and what we feel deep down. It is not meant to insult the Italians, the French, the Russians or the Chinese. It pokes fun at the Israelis themselves and then it turns more serious. We have a complex relationship with the Palestinians, that is clear. You are in a restaurant. You’ve ordered a cup of coffee. And you see a fly in the cup. What do you do? Italian – spills out the coffee and leaves the restaurant in anger. 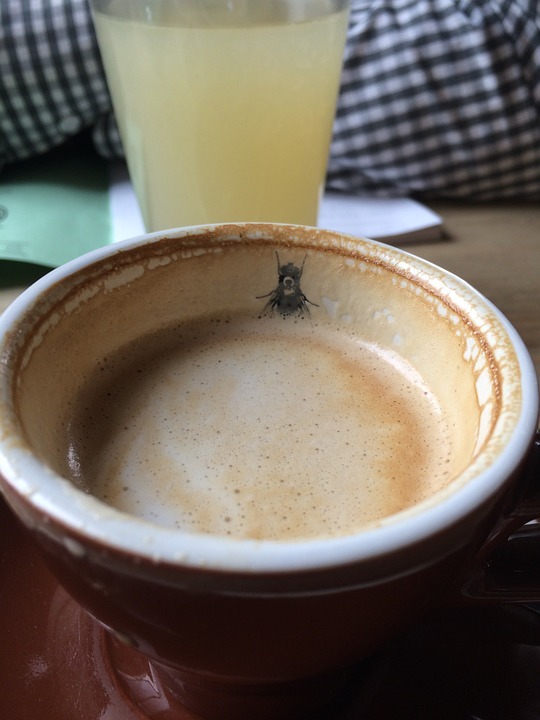 French – takes out the fly and drinks the coffee. Chinese – eats the fly and throws away the coffee. Russian – quietly drinks the coffee together with the fly. And here’s where the joke becomes a bit more serious, a bit more sad, a bit more cynical. Israeli – sells the coffee to the Frenchman, sells the fly to the Chinese man. Then he buys himself another cup of coffee and with the profits from the sale, he creates an invention that will stop flies from entering coffee cups. Palestinian – accuses the Israeli of putting the fly in his coffee, files a complaint with the United Nations. Then he takes a loan from the European Union so he can buy himself a new cup of coffee. He uses the extra money to purchase explosives and then blows up the coffee house where the Italian, Russian, French and Chinese men are trying to explain to the Israeli why he should give his coffee to the Palestinian. Is this joke racist? Well, the easy answer is probably a little. Is it politically correct? Probably not. Is it true? Well, I don’t know that the Italian would throw his coffee away and walk away in disgust. I don’t know if the Frenchman would take out the fly and still drink the coffee. And, I don’t know about the behavior of the Russian or the Chinese man either. The Israeli probably wouldn’t sell his coffee – Israelis do love coffee! And the reaction of the Palestinian – no, obviously a single Palestinian walking into a cafe would not suddenly accuse a single Israeli of putting the fly in his cup, wouldn’t apply to the UN or the EU. As for blowing up the cafe, well, there are dozens of instances where Palestinians have blown up cafes…and buses…and malls. Would he blame Israel? Hell, yes! They do every day! And would the Russian, French, Italian and Chinese men try to convince the Israeli to solve the Palestinian’s problem? Well, hell yes to that too. In June 2005, Wafa Samir Ibraim Bas, then 21 years old, was caught with 10 kilos of explosives. During questioning, she admitted that she was on her way to blow herself up in the Soroka hospital. She had a doctor’s appointment where they had been treating her and thought to use that opportunity to blow the hospital up. That was a hospital and thankfully, the planned attack failed. Attacks on the Sbarro (Jerusalem, 2001), Cafe Moment (Jerusalem, 2002), Cafe Hillel (Jerusalem, 2003), just to name a few, were intentionally perpetrated by Palestinian suicide bombers. And blaming Israel, well, search Google for “Palestinians blame Israel” and you’ll get 12 million results. Most recently, Palestinians blamed Israel for a shortage of tires…after they burned 10,000 tires in protests and riots on the border. They blamed us for Arafat’s death. In 2015, the Palestinians blamed Israel for flooding Gaza after extensive rain hit the region. Tel Aviv was flooded as were many areas in Israel. Likewise, Gaza flooded. Only the Gazans blamed Israel – not for the rain, but for opening a number of dams. Never mind the fact that there are NO dams in the areas surrounding Gaza (or any other location in southern Israel). So while the fly joke certainly would never happen – Israelis sometimes need to laugh. And sometimes, the humor becomes a bit sour, a bit too close to reality. Brilliant post!! Spot on!! Please keep on blogging!